In addition to a collection of aerial photographs from the great conflicts of the mid-twentieth century, we will show recent work by artist David Bailey. 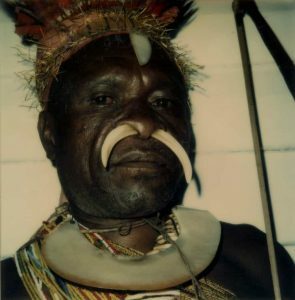 Having already been surprised by the discovery of a number of 1974 Polaroids taken by Bailey of Papua New Guinea and Planet of the Apes, it was uncanny to learn that for the past year and a half he has been photographing televised footage from the Second World War. Daniel only found out when he showed Bailey the invitation for the gallery’s Paris Photo exhibition, “Airborne”. Thus for the first time we will present to the public Bailey’s most recent photographic adventure in the form of large scale photographs shot with a digital camera. When Bailey takes photos of what he sees on film he increases the number of transitions between event and image to a level of abstraction that no longer has much to do with what actually took place. The image is morphed into something else, losing its historic context and becoming entirely Bailey’s.